Music synthesis is not new, especially in Clojureland. However, modeling Carnatic (south indian classical) music, then generating and machine-learning it has been attempted by only a few, and is a very interesting problem to solve. This talk is the story of my journey in bridging the gap between machine and human music. We will teach machines the fundamental concepts, create models that identify Carnatic music, and then build models that allow the machines to learn music themselves, and in the process, teach us. The data collection process involves primarily mining the internet, and then stiching together, and deduplicating different pieces from different sources. This also involves doing phonetic matching in Indic languages, which is really interesting. There are also some very interesting by products of this process that include raga identification, and automatic transcription. The talk will (obviously) include demos of comparisons of machine and human (my) music, code snippets of implementation in Clojure/Overtone, and pretty melographs. Srihari is a FOSS enthusiast. He has contributed to Gimp, Eclipse, Diaspora and is excited about opportunities to give back. He has been writing Clojure for over 5 years now, and over this time, he has engineered low latency systems, large analytics platforms, monitoring solutions, distributed payment platforms and multiple simulation testing systems. He is passionate about fostering the Clojure community, conducts workshops, and organizes IN/Clojure. He also works on computational music synthesis and generation as a hobby. 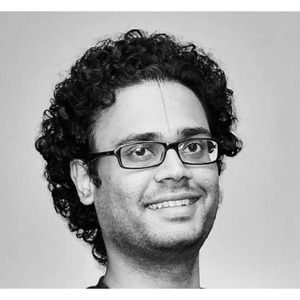 He is a partner at nilenso, a hippie tree hugging bicycle riding software cooperative based in Bangalore.